Pressure cookers are able to cook meats quickly and thoroughly while keeping them moist and delicious. The meats are placed in water or some cooking liquid and the lid is typically tightly sealed with a gasket, which allows for steam to build up to facilitate quick cooking under high pressure. But why choose an electric pressure cooker over a traditional stovetop one? There are several benefits. One is the ability to program an electric one to control the process of pressure cooking and another is the enhanced safety features. Many electric cookers also come with options to steam, brown or slow cook the food. Some of the best electric pressure cookers automatically turn off when cooking is done or automatically switch to keeping the food warm. When shopping for an electric cooker, make sure that it is large enough to cook the amount you need on a regular basis. Know what you will be using the cooker for to ultimately determine which one will best fit your needs. Also keep in mind that while most stovetop pressure cookers are able to reach 15 psi, electric ones won’t. That doesn’t mean that they won’t work great. All you have to do is adjust cooking times. If you like to do slow cooking often at really low temperatures over a long period of times, a proper electric slow cooker is a great appliance to have and is superior to the slow cook option on a pressure cooker. The following top rated electric pressure cookers run the gamut in price and number of features, so you should be able to find one that fits your specific needs and budget. This Cuisinart CPC-600 is a best selling electric pressure cooker and provides two different settings for pressure cooking (high and low), plus browning, sauté, simmer and keep warm functions and operates at 1000 watts. In addition to its main function, you can also cook everything from rice to stews to stir fries and desserts in its electric non-stick cooking pot. You can pre-set temperatures for the jobs that don’t require pressure cooking, and the built in digital thermostat helps control the temperature at which food cooks. It has an automatic keep warm function that it will switch to when cooking is done. After choosing the method of cooking, if you select the pressure setting and close the cooker, you can then set the timer for up to 99 minutes and the LED panel countdown will display. Its safety features include cool touch handles to prevent burning your hands and pressure cannot build up unless the lid is properly locked in. You also cannot release the lid until pressure reduces to zero after the end of cooking. The included trivet and the cooking pot are easy to clean and dishwasher safe. Most users rate this cooker with 5 stars but there are a few complaints that pressure stops building in the cooker after a few months. This is easily remedied by removing and cleaning the gasket and opening up the valve and thoroughly cleaning that with a toothpick. Although more expensive than the Cuisinart above, the IP DUO60 Pressure Cooker is the top rated electric pressure cooker as it allows you to use it in seven different ways including for making yogurt, for browning/sautéing, slow cooking, rice cooking, steaming and warming. There is an option of three different temperatures to use when sautéing, three different ones for slow cooking, an option of two different pressure levels, an automatic keep warm function and 14 different smart programs from which to choose depending on what kind of dish you’re preparing. You can program this 6Qt/1000W cooker up to 24 hours in advance to suit your schedule and it will start at the set time without the need for you to be there. This electric stainless steel pressure cooker is energy efficient and easy to clean and has several safety mechanisms built in. These include safe lid locking, pressure range sensor and controller, temperature sensor and leaky lid detector. Since there is no non-stick surface in the cooking pot, you can be assured of safe cooking. The unit comes with a stainless steel steaming rack with handles to raise and lower food safely into the pot, a soup spoon, measuring cup and a rice paddle. Consumers like that this cooker makes things so fast and easy because it eliminates the need for having too many other pots and pans and you can use it for lots of different cooking methods. It is so popular that we also chose it as one of our picks for best multi-cookers. However, be sure that this size is right for you as it does take up a lot of counter and storage space. The only other point to note is that it may take a bit of time getting used to using it and you’ll have to adjust cooking times in the beginning to see what works. If 6 quarts is too small for your family, this eight quart MaxiMatic Elite Platinum Cooker can also cook fast and efficiently even with the larger quantity of food. It has a non-stick interior and has 14 different functions for cooking including reheat, white rice, brown rice, wild rice/grains, vegetables & fish, chicken, beef, pork & ribs, beans, desserts, potatoes, stew, soup, and browning/keep warm. You can even use the browning function on meat first before switching to pressure cooking to finish off. You can preset the cooker to start cooking up to 24 hours ahead of time and it will keep the food warm for up to 12 hours after it is done. It comes with a digital control panel that is easy to operate with an LED display for an easy read. It can pressurize for up to 99 minutes and there is an indicator that sounds off to let you know when the cooking cycle is finished. In case of a power outage this unit resumes automatically to help prevent ruining your meal once the power comes back on. While it does not have a “slow cooking” option, you can use a combination of the delayed timer and one of the other cooking functions instead. You can remove the 8 qt non-stick pot inside to clean it, but some consumers do not like how hard it can be to clean the rest of the machine. The exterior of the MaxiMatic is made of stainless steel which is durable and easy to clean. The GoWise Pressure Cooking Pot comes in 3 sizes – 4, 6 and 8 quarts, and provides a six in one capability of cooking. It comes with a health safe stainless steel inner cooking pot with functions for timed pressure cooking, Sautéing, Browning, Steaming, Slow cooking, Warming, cooking beans, meat stew and white and brown rice. There are multiple items that come along with the cooker including a cooking rack, plastic cup, and a spoon. The cook pot is removable so it’s easy to clean although some consumers find it a bit messy. It has a stainless steel exterior as well. There are other items that are included with this pressure cooker including a floating valve, an anti-blocking case, a condensation reservoir and a temperature sensor. The lid is self-locking with a rubber gasket to keep in the heat and its handles are cool to the touch to prevent burning your hands. The LED panel lets you know when pressure cooking starts, the actual pressure, the time left and shows you what other functions are on at any given time. The instruction manual provided is a bit sparse but it is easy to use once you’ve fiddled with it. 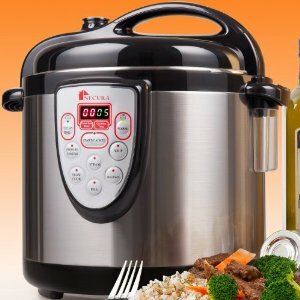 This Secura Electric Pressure Cooker has an 18/10 stainless steel exterior and it is able to slow cook, steam, cook rice, brown, saute, and make soup and after that automatically switch to keep warm. It has a lid bracket and comes with several other items including a rice spoon, recipe book, and a measuring cup. It has a temperature and time control system and a 24 hour delay timer to allow you to prepare ahead of time. Before cooking starts, you can add or subtract minutes to the cooking cycle. There are benefits to having this pressure cooker as it not only cooks the food to perfection but also provides a number of features that make cooking easy. It has a digital display for easy reading and handles that remain cool throughout cooking to prevent burning your hands. As it is attractive in appearance and well built it will look great in your kitchen. It has a stainless steel pot, so while rice may stick to the inside you can be sure that non-stick coating won’t leech into your food. However, you can buy the optional non-stick cooking pot as well as an optional stainless steel steam basket and steam rack if you want. As you can see, some of these pressure cookers include a rice function. If you’re a frequent rice eater you might want to take a look at more specialized rice cooker appliances like these.